Mi A Dong was a family-run business, and when they decided to shut down (not for want of business, mind you) their family recipe disappeared with them. I’m sure had they wanted to, they could have sold that recipe for millions. I suspect (and secretly hope) that they did not sell the recipe in anticipation of one day re-opening the restaurant…I’m still awaiting that day. 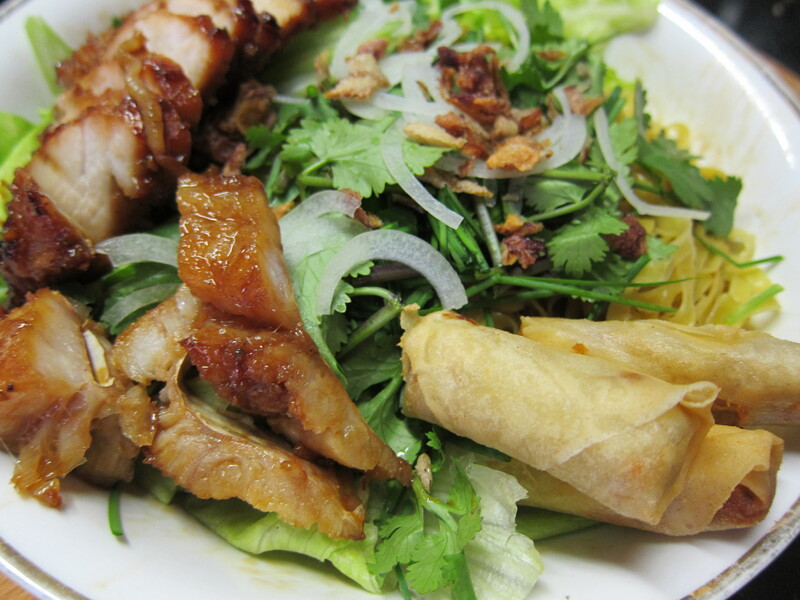 There has been no adequate substitute since – although most foodies would know about Mi Tan Viet, the fabulous crispy skin chicken noodle house on John Street, Cabramatta. 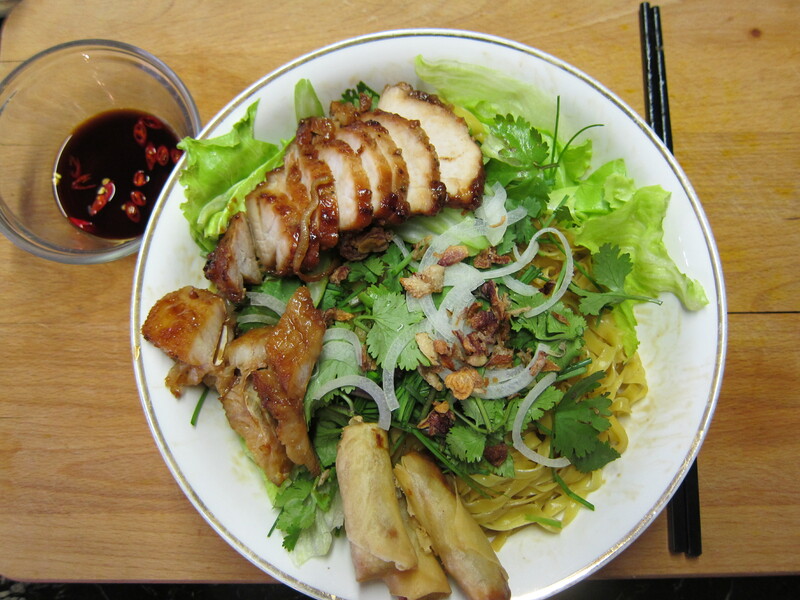 So alas, like many things, when you can’t find someone to do it properly for you, you just have to do it yourself… which brings me to today’s home-made lunch: dried egg noodles with slow roast pork leg, ling fish, vegetarian spring rolls (to substitute the Mi A Dong prawn cracker), onion, greens (lettuce, garlic chives and coriander) and crispy garlic. Served, of course, with a fresh chilli, soy and red vinegar dipping sauce. Dry noodles, for a very wet Sydney day. What are you having for lunch today? Where’s your favourite nostalgic food place? All I’ve been talking to my husband about is Mi A Dong for the last three months. I’m pregnant with my third child and it’s all I’m dreaming of. I can’t believe I’ve found another person who loved it as much as myself. It was the best treat for me; a trip to Cabramatta in the morning; the dark, high ceiling interior lit mainly by the natural light from the front door. It was a narrow restaurant, a bit dingy but always made me feel like I was transported into a Chinese movie; the large white lanterns, dark wood, and your trade mark Chinese artworks everywhere complete with dangling red tassels. My favorite was the noodle soup. The crispy battered prawns were the highlight. The noodles so firm and springy. The broth so fragrant unlike today where all I smell is something akin to chicken salt. Oh and the fried pork fat! Heaven. The closest noodles I’ve ever had was this restaurant that opened very briefly, and made the nicest, generous serving of ga gia don. I know they moved but I don’t know where! So happy to know it wasn’t just me and murky nostalgia.